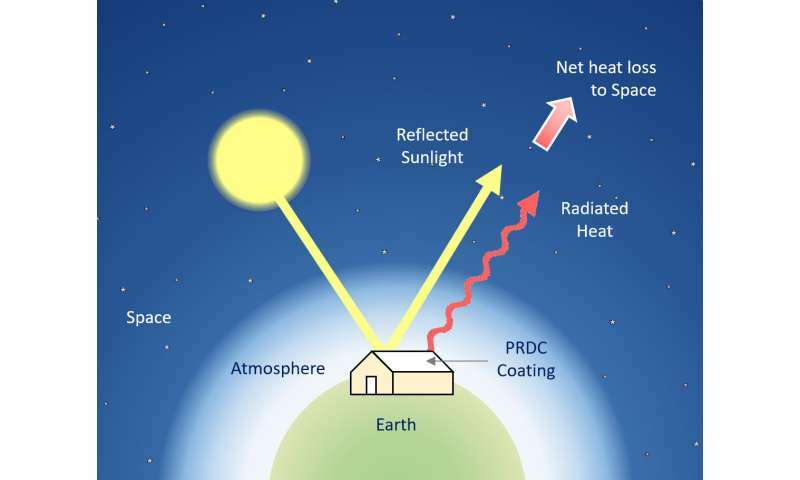 An alternative to these energy-intensive cooling methods is passive daytime radiative cooling (PDRC), a phenomenon where a surface spontaneously cools by reflecting sunlight and radiating heat to the colder atmosphere. PDRC is most effective if a surface has a high solar reflectance (R) that minimizes solar heat gain, and a high, thermal emittance (ε) that maximizes radiative heat loss to the sky. 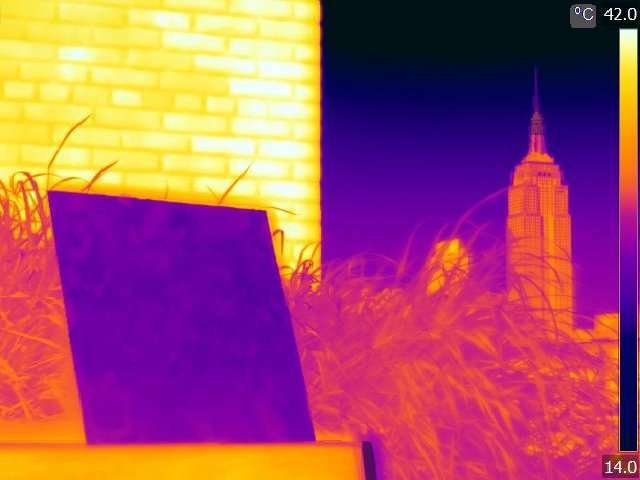 If R and ε are sufficiently high, a net heat loss can occur, even under sunlight. The team—Yuan Yang, assistant professor of materials science and engineering; Nanfang Yu, associate professor of applied physics; and Jyotirmoy Mandal, lead author of the study and a doctoral student in Yang's group (all department of applied physics and applied mathematics)—built upon earlier work that demonstrated that simple plastics and polymers, including acrylic, silicone, and PET, are excellent heat radiators and could be used for PDRC. The challenges were how to get these normally transparent polymers to reflect sunlight without using silver mirrors as reflectors and how to make them easily deployable. They decided to use phase-inversion because it is a simple, solution-based method for making light-scattering air-voids in polymers. Polymers and solvents are already used in paints, and the Columbia Engineering method essentially replaces the pigments in white paint with air voids that reflect all wavelengths of sunlight, from UV to infrared. "This simple but fundamental modification yields exceptional R and ε that equal or surpass those of state-of-the-art PDRC designs, but with a convenience that is almost paint-like," says Mandal. The researchers found their polymer coating's high solar reflectance (R > 96%) and high thermal emittance (ε ~ 97%) kept it significantly cooler than its environment under widely different skies, e.g. by 6 C in the warm, arid desert in Arizona and 3 C in the foggy, tropical environment of Bangladesh. "The fact that cooling is achieved in both desert and tropical climates, without any thermal protection or shielding, demonstrates the utility of our design wherever cooling is required," Yang notes. The team also created colored polymer coatings with cooling capabilities by adding dyes. "Achieving a superior balance between color and cooling performance over current paints is one of the most important aspects of our work," Yu notes. "For exterior coatings, the choice of color is often subjective, and paint manufacturers have been trying to make colored coatings, like those for roofs, for decades." The group took environmental and operational issues, such as recyclability, bio-compatibility, and high-temperature operability, into consideration, and showed that their technique can be generalized to a range of polymers to achieve these functionalities. "Polymers are an amazingly diverse class of materials, and because this technique is generic, additional desirable properties can be conveniently integrated into our PDRC coatings, if suitable polymers are available," Mandal adds. "Nature offers many ways for heating and cooling, some of which are extremely well known and widely studied and others that are poorly known. Radiative cooling—by using the sky as a heat sink—belongs to the latter group, and its potential has been strangely overlooked by materials scientists until a few years ago," says Uppsala University Physics Professor Claes-Göran Granqvist, a pioneer in the field of radiative cooling, who was not involved with the study. "The publication by Mandal et al. 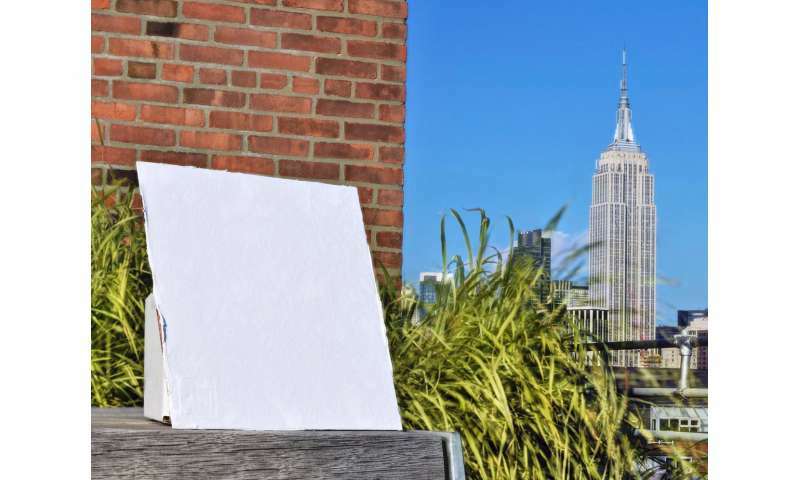 highlights the importance of radiative cooling and represents an important breakthrough by demonstrating that hierarchically porous polymer coatings, which can be prepared cheaply and conveniently, give excellent cooling even in full sunlight." "Now is a critical time to develop promising solutions for sustainable humanity," Yang notes, "This year, we witnessed heat waves and record-breaking temperatures in North America, Europe, Asia, and Australia. It is essential that we find solutions to this climate challenge, and we are very excited to be working on this new technology that addresses it." Yu adds that he used to think that white was the most unattainable color: "When I studied watercolor painting years ago, white paints were the most expensive. Cremnitz white or lead white was the choice of great masters, including Rembrandt and Lucian Freud. We have now demonstrated that white is in fact the most achievable color. It can be made using nothing more than properly sized air voids embedded in a transparent medium. Air voids are what make snow white and Saharan silver ants silvery." The study is titled "Hierarchically Porous Polymer Coatings for Highly Efficient Passive Daytime Radiative Cooling." Be good if unlike most plastics it isn't susceptible to UV damage. In Florida I have used most of the major brands of roof and wall polymer paints. Most are highly reflective, however mold, mildew and cyanobacteria rapidly colonize the porous surface (especially on low slope roofs) and turn the white roof to gray or black. Some of the polymer paints are actually digested by their micro-ecosystems giving them a useful life of on three or four years before they crack and curl up and expose the under-layment. In order to be effective in higher humidity climates any polymer finish is going to have to have an anti-fouling component.